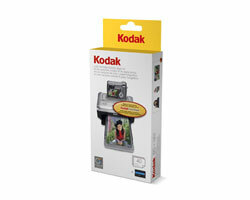 The KODAK Color Cartridge & Photo Paper Kit gives you everything you need to easily print real KODAK Pictures up to 4 × 6 in. that are waterproof, stain-resistant, and last a lifetime. Kit includes color cartridge and 4 × 6 in. photo paper.